This page contains information and pictures about Belid Beetles in family BELIDAE that we found in the Brisbane area, Queensland, Australia. This is a small family very close related with the true weevil CURCULIONIDAE. Their 10-seggmented antenna is straight, not elbowed and not clubbed. Their body is elongated and in cylindrical form, more or less parallel-sided. 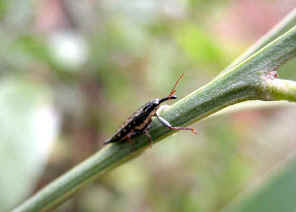 Likes the true weevils, their rostrum is usually very long. Adults fly actively during the day. 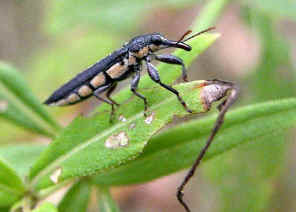 Adults and larvae are feed on plants. 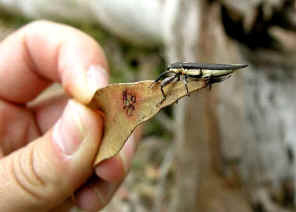 Their larvae are known to bore into stems and branches. This group of beetles is almost exclusively found in Australia. They also known as the primitive weevils, as to distinguish them from the true weevils. This beetle was found in a front yard in Yeerongpilly in summer. It look like a true weevil family member but its antenna is straight and not clubbed. We also found it in Karawatha Forest on Acacia during early summer. More information and pictures can be found in this page. 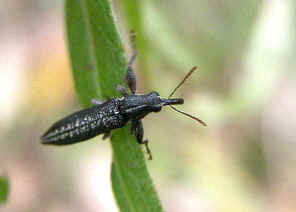 This weevil is reddish brown in colour with a white strip along the top of the body. It drop onto the ground when disturbed. More pictures can be found in this page. 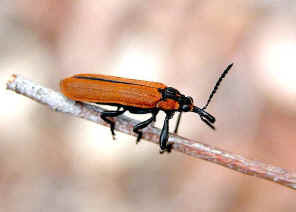 We found this Belid Beetle early summer on Acacia leaf in Karawatha Forest. This beetle is a very good flier. It filed high and disappeared after we took the above photos. 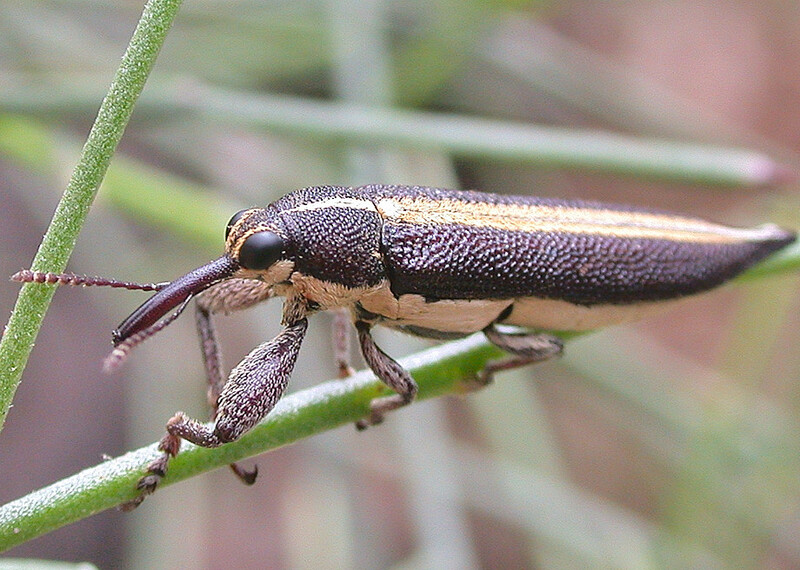 In mid summer we found the weevil again in rainforest near Mt Nebo. More information please click on here. This is the Belid Beetle that mimics Lycid Beetle. 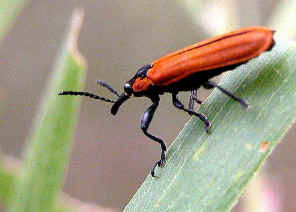 The brick-red and black colours of of Lycid Beetle are a warning to predators that the beetle is highly toxic and distasteful. 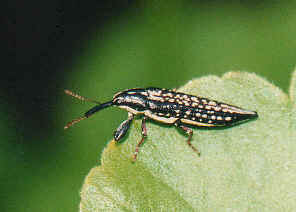 Many other insects includes this weevil, mimic its colours. 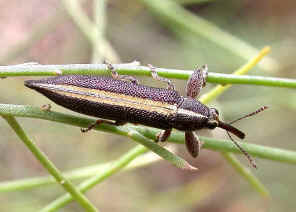 This beetle can be found on different species of Acacia trees. They are quite common in Brisbane Eucalypt forest. Please check this page for more information. 1. Insects of Australia, CSIRO, Division of Entomology, Melbourne University Press, 2nd Edition 1991, p 679. 3. Beetles of Australia - Trevor J Hawkeswood, Angus & Robertson Publishers, 1987, p124. 4. Belidae - From Wikipedia, the free encyclopedia, 2008.